Salt Lake Airport Car Rental is a part of an international rental broker VIP Cars and, thus, has friendly tie-ups with a leading network of suppliers in Salt Lake City. 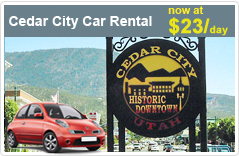 We present some of the best St. George Municipal Airport car rental deals at most competitive prices. When you rent a car at St. George Municipal Airport, you get the convenience of planning your stay as per your schedule. Both business and leisure travelers can find a suitable rental car with us, as our suppliers provide us with finest fleet of economical and high ends cars. With exclusive discounts, top rental inclusions, easy online booking and 24/7 booking support, we make your car rental experience unforgettable. The largest airport in the southern part of Utah, St. George Municipal Airport has regular scheduled flights available throughout the year. St. George Municipal Airport is located in the county of Washington on Utah, USA, 5.8 miles from the downtown area of St. George. The airport is equipped with Air Traffic Control Tower and precision instrument approach. General aviation is offered by St. George Municipal Airport and other services such as fueling, flight instructions, aircraft maintenance and scenic sightseeing trips. We give you the most from your holiday to both business and leisure travelers with the most competitive St. George Municipal Airport car rental deal. Hire a car at St. George Municipal Airport with us now!